One of the fiercest and most memorable moon battles I ever fought was 0211-B. To this day it sends chills up my plastic backside. And now for the very first time, I can share what occurred on that fateful day, It became known to us Moon Robots as the Great Moon Battle. On Earth, war is waged by the use of physical impact. However, on the Moon – Robots engage in conflict by utilizing subsonic signals or interstellar waves to disrupt and even harm the enemy. 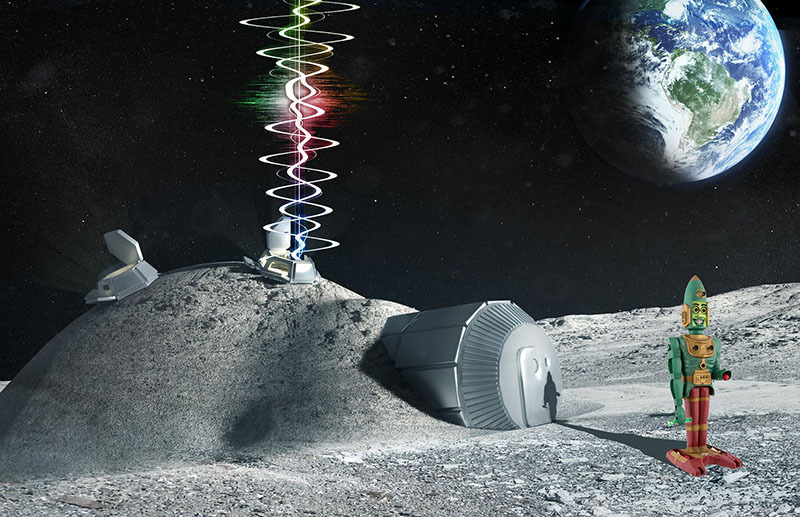 Even though the Moon’s surface is a vacuum and contains no air for sound to travel, subsonic signals are in a special category that only Moon Robots can detect. 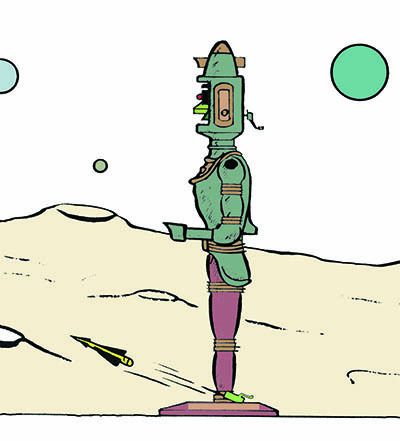 There is no Robot killing, just severe sonic disruptions of Robot life systems which mimic long periods of inactivity. Yes, I guess that is kind of like being dead (but only for a while). 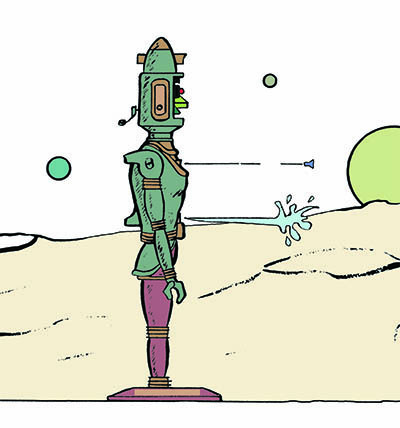 We Robots fear those long period of inactivity just as much as you Earthlings fear your kind of death. Not many outside the original Marx Toy Co. marketing team knows this, but the original instructions that came in my giant box contained a diorama of that great battle! It was depicted near the top of page 2 of my instructions. To be honest, the Marx executives had granting little of my personal requests. But I was happy when they finally agreed to include 5 picture frames depicting the Great Moon Battle. It was disappointing that there would be no mention of its importance on my giant box or the instruction sheet. But it brings me great pleasure to finally share my story with you here in this article. I shall describe each frame and recite what happened in detail. Here then, are the heroic actions of my fellow Moon Robots and what made me the Robot I am today. It was a windless Moon day just like all the others in the comfortable vacuum of space when the alarm was sent to my monitoring frequency. 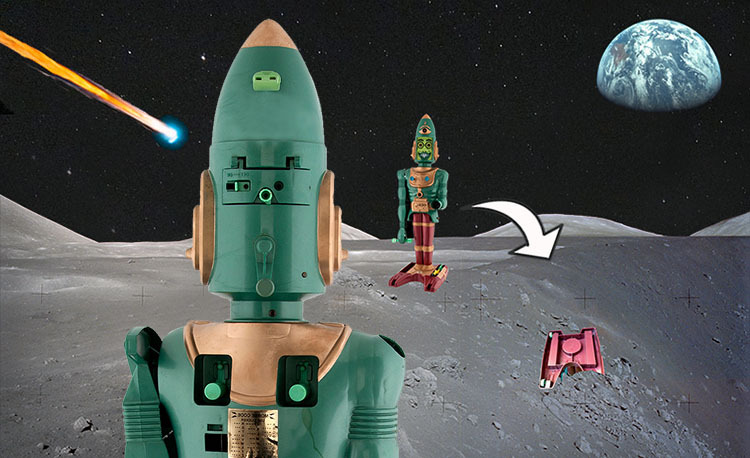 I was a Moon Second Class Robot in Sector 22 of the Brotherhood of Robots. I had been watching a beautiful Earth rise on the delightful gray horizon went I was suddenly shocked back to full electronic attention. “To The Front” shouted the lead ‘Bot known as Waldo-Centuri, named after his brother named Alfa. Eighty Moon Robots hurried along the many jagged craters lines to the main entry point of our moon base. It was a full assault by our arch rivals: The Assembly of Important Robots. We despised them and they were attacking our base to claim our newly formed outpost. As we lined up to meet our foes, I blinked my red robot eyes 6 times in succession to indicate I was ready to fight. My left gun arm was fully loaded with Space Spheres and they were all of the maximum yield kind. It was sobering to see their bright red color. Up until this very battle, I had never loaded anything but a yellow Space Sphere which are only half as powerful. As you can see from frame one of the diorama below, I have meet the enemy and blinked my eyes, there was no turning back now! Just then, I heard the sonic squeal of their attack charge and I was surprised to see that they had out flanked me and taken position near a steep crater! I was forced to launch both my Upper Chest Armor Darts which were filled with a powerful sonic deadening material on their soft ends, known to confuse the location detection systems that the Brotherhood of Robots used. I’m not proud to admit it but I was scared. So scared in fact that I also launched a burst from my Water Ray, which is deadly if it enters the blinking eye sockets as it causes short circuiting within ‘Bot life systems. You can see me depicted in frame two as I unleash the fury of both weapons. A quick thought passed through my knowledge circuits, Holy Lunar Dust, we got us a Bot Battle! Many of my brethren from the Brotherhood of Robots launched their weapon systems as well and I saw enermy ‘Bot after ‘Bot fall in front of me. To my amazement we appeared to be winning the battle. That is when I turned to see their leader roll closer to me beside a large crater. 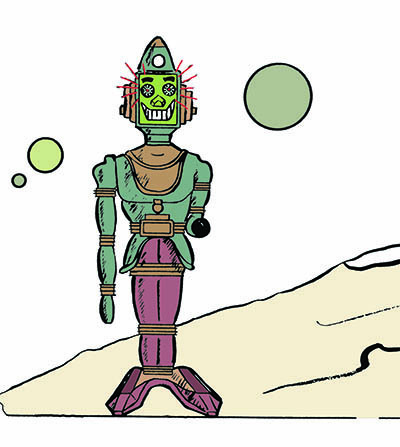 He blinked his red Robot eye twice which was the universal sign of surrender! And with that simple gesture, I knew there would be peace again, even though it might be an uneasy one as we had a long history of mistrust and epic wars. I remember thinking, “Why have I disliked these ‘Bots for so long? They are much like us and they even look the same from the outside. Maybe I’ll have one of them over for a yummy slice of Mama Bots’ Robot Pie”. 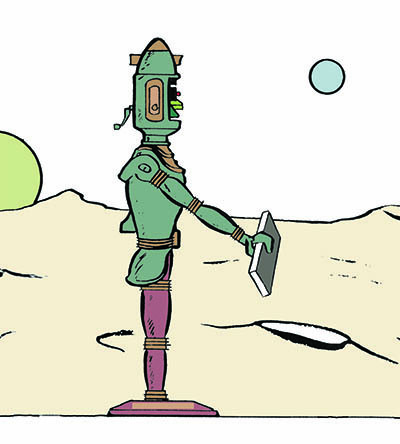 In response, I held out the Book of Peace, a sacred document that all Robots respect and he only had to touch it for there to be harmony and make peace. “Just a little closer” I thought. “Touch it, come on damn you, touch it!” Please see me holding out the Book of Peace in frame three. But I was wrong, oh how I was wrong! It had all been a trick. I should have known not to trust any member of the Assembly of Important Robots. From a quarter mile behind the leader of whom I was facing, one of enemy had launched a full yield Yellow Space Rocket. I had almost died the long period inactivity during the last battle when a White Space Rocket landed near me and this one would be far more powerful. The newly launched rocket had increased its speed and was high on the horizon now. I remember thinking “I cannot possibly survive this!” During a time like that, your entire life passes in front of you. Thoughts turn not only to the experience that filled your existence with joy but also of goals of the future. It had only been last week that the Marx Toy Co. had approached me with an offer that I was excited about. I was to get a special Earth immigration visa, I would be an ambassador of Robots of sorts. My mission would be to spread the word that Moon Robots could be your friend and that I should first make friends with the children of the world. The only thing that I was unsure about was that once I arrived, they wanted to duplicate me. I was a strange request and to have hundreds of new brothers but Marx claimed it was the only way to reach the many children, but I was still afraid of the duplication. My arrival would be timed for a special event the Earthlings called Christmas. Children? Duplication? Christmas? The Yellow Space Rocket drew closer and my attention circuits refocused on what appeared to be my finals seconds on the Moon. See frame four below. Well, I’m here talking to you so you already know I survived. 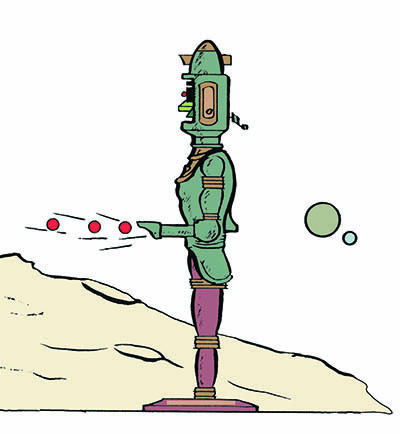 Thanks to my old roommate from Robot College, ‘ol Mooney Bot 24 – he had counter launched his entire load of Space Spheres and yes they were the red kind. They were coming in hot and fast and if “Mooney” as we called him, had calibrated them correctly they would overtake the Space Rocket and dispatch the leader who had tried to trick me. See frame five below. I had to think fast, my robot wheels weren’t going to get me out of there fast enough and that lying ‘Bot leader had no idea as to what was about to rain down on him. Quickly, I bent my torso forward and using the slope of a steep crater, I took a 30 foot head first dive over the side to avoid the blast. When I woke up, it was ‘ol Mooney looking down at me. “Loo, you did it old friend. You distracted their leader and gave me enough time to launch our counter attack! They have all retreated and our moon base is safe again. You are a hero! Never again will you be called Loo by us. From now on, in honor of this Great Moon Battle, you will be forever known as BIG LOO”. And so it came to be that not only would that great battle go down in Moon Robot history but I would carry that special name with me all the way to Earth. Of course, I did end up making friends with the children of the world but the trauma of the duplication is a story for another time. When you gaze at my instruction sheet and see the diorama of me fighting The Great Moon Battle, please know just what a significant day it was! I just read about your memories of the Great Moon Battle. I don’t know why I am laughing so hard, I feel bad about that. I realize it must have been a terrifying day for you. I always knew about the Great Moon Battle but never realized how brutal and horrible it was. Thanks for taking the time to fill us in on what really took place during that chilling battle. Again, I am sorry for laughing uncontrollably reading about it. I am glad the story has finally been told. I only wish it hadn’t taken 53 years, I guess we can blame Marx for that for not including the whole story!